developing enthusiasm and new ideas. stimulates mental acuity, and relieves anxiety and stress. It regulates metabolism, balances hormones and relieves menstrual tension. lowers blood pressure, and aids in digestion. The astrological signs of Spectrolite are Scorpio, Sagittarius and Leo. Associated with the Winter season, and the January Moon (Wolf Moon). Spectrolite – variety of labradorite displaying with intense reds, oranges and yellows as well as blues and greens. These colors are due to light interference by thin lamellae (parallel layers) within the Spectrolite. The color play is iridescent like the feathers of a peacock or the Northern Lights. Spectrolite belongs to the plagioclase feldspar group, a series of mixtures of sodium and calcium aluminum silicates. Spectrolite has a hardness of 6 to 6.5 on the Mohs scale and a specific gravity of 2.69 – 2.72. Spectrolite is the very high grade of dark based Labradorite that is found only in Finland. The name “Spectrolite” is a trade name given to this material by the Finns, and only this material can truly be called Spectrolite. This outstanding example of Spectrolite from Finland will knock your socks off! Alluring and bold, vibrant colors including the very rare purple dance across the surface of this magnificent pendant! 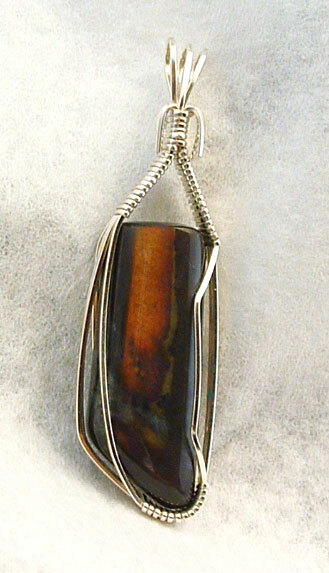 To purchase this incredible pendant, please visit my web-store: Wrapped to Go!